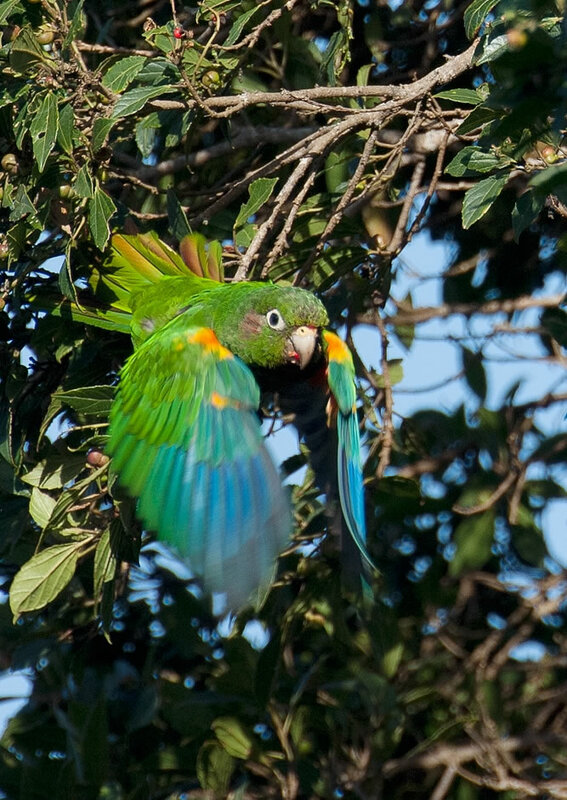 Important habitat for a rare bird, Colombia’s endangered Santa Marta Parakeet, will now be protected following the purchase of a property by ProAves, a leading Colombian conservation organization with support from American Bird Conservancy (ABC), a leading U.S. bird conservation organization. The 148-acre tract, known as the La Cumbre property, expands the El Dorado Reserve, which was also created by ABC and ProAves, along with Conservation International. In 2006, the reserve was created when the groups partnered to protect 1,600 acres of key parakeet habitat beyond the nearby national park. Additional land acquisitions in 2010 and 2012 enlarged the reserve to its current 2,250 acres. El Dorado Reserve is located in Colombia’s Sierra Nevada de Santa Marta, an ancient and isolated massif in the extreme northern part of the country only a few miles from the Caribbean Sea. It is the only location on earth where this endemic species of parrot resides. “This property is a conservation jewel,” said Dr. George Fenwick, President of ABC. “It is in an area that is ranked as the second-most important site for threatened birds and amphibians in the world. It also provides critical habitat for more than 40 neo-tropical migratory birds and holds exceptional levels of diversity and high levels of endemism for plants, amphibians, and butterflies,” he added. Santa Marta Bush-Tyrant, also an endangered species, and Santa Marta Warbler are two of the other endemic birds that occur here. No fewer than 19 endemic bird species and more than 52 subspecies of birds are restricted to the Sierra Nevada de Santa Marta. The full range of tropical wet life-zones condensed along the northern slope of the Sierra Nevada has resulted in extraordinary diversity, with 635 bird species recorded. These mountains are a vital stopover point for declining neotropical migratory birds that breed in the United States and Canada, such as the Cerulean and Golden-winged Warblers. The presence of multiple threatened species found only at this site was recognized by the Alliance for Zero Extinction, a global initiative aimed at halting species loss. Tragically, only 15 percent of the Sierra Nevada’s original vegetation remains unaltered following decades of colonization and agricultural expansion. Despite the national park, encroachment and deforestation continue to fragment and denude the sensitive montane forest ecosystems at the highest elevations of the massif. Compounding the issue is the fact that many of the endemic species only survive at elevations between 4,300 and 9,500 feet, where their range comprises fewer than 200 square miles. Deterioration of this habitat presents a real risk of extinction for many of these endemics. While the 148-acre property is only partially forested, it supports an important concentration of the Ceroxylon ceriferum palms (commonly known as Andean wax palm) needed by nesting Santa Marta Parakeets. With continued support from ABC, ProAves will hire an additional forest guard to support parakeet monitoring and habitat restoration in the area where the parakeets feed and roost. ProAves has been successful bolstering the population of parakeets by installing artificial next boxes, supported by Loro Parque Foundation. The additional forest guard will also be critical to protecting an area that has undergone increased pressure by developers. The presence of ProAves staff successfully repelled a recent incursion on the reserve to build vacation homes, resulting in legal action that will further safeguard this site. In addition to the Santa Marta Parakeet, the area is a stronghold for several frog species: Atelopus laetissimus(Critically Endangered), Atelopus nahumae (Critically Endangered), Eleutherodactylus ruthveni (Endangered), and Eleutherodactylus insignatus (Endangered). This project was supported by many organizations and individuals, including World Land Trust, Robert Wilson Trust, Marshall-Reynolds Foundation, Quick Response Biodiversity Fund, the Weeden Foundation, David Harrison, David and Patricia Davidson, Jeff and Connie Woodman, Jeff Peters, Ted Reissing, Nancy Weiss, and Joan Hero.